Kayaks are a popular platform for fishing mainly because of their small size and the ability to remain stable. Therefore, as long as you can find a well-made one, there’s absolutely no limit as to the kind of limits you could unlock. Whatever your preferences might be, you should always remember that your safety is paramount. You’ll never discover the beauty of fishing until you do so on a kayak. And to help you do that, the table below digs deeper into details. 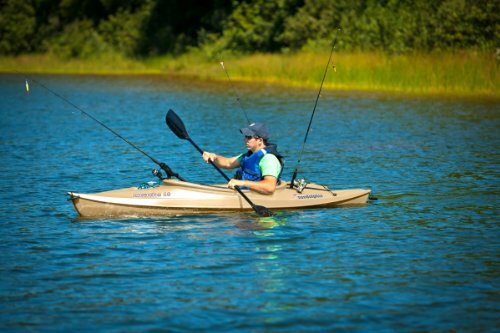 Lifetime Tamarack Angler is a budget Kayak suitable for fishing, paddling or exploring the shores. The kayak comes with many features to meet your needs. The kayak is constructed from high-density UV-protected polyethylene. The material is strong to withstand waves and therefore durable. It has an adjustable padded seat for your comfort and footrests to fit different sizes of riders. Its weight capacity is 275lbs. In terms of storage space, the Lifetime Tamarack Angler has two 6" storage compartments in the center and rear of the kayak. It also has three fishing rod holders, one top mount and two flush mounted that are within an arm’s reach. Other features include stability chains, T-handles for carrying it, and a paddle keeper. The kayak has two shock cord straps, front, and rear. Kayaks are generally very expensive, but this one comes at an affordable price. You have a choice between buying one with a paddle or without. One without a paddle is much cheaper. The weight limit is low compared to other canoes that have 500 pounds. As the name suggests, Sea Eagle Inflatable kayak is a two-person inflatable kayak that comes with many conveniences. The kayak can manage up to class three white waters and can be used for skin diving, fishing, yacht tending among other kayaking sports. The kayak has a three-year manufacturer’s warranty. In addition, it is quite an affordable fishing kayak priced below $300. It is also durable, very portable, and easy to inflate or deflate. It is simply inflated and fits well in the included 26 by 48 carry bag, making it very portable. This kayak is extremely light at 26lbs and can be carried by one person, yet it has a high maximum weight capacity of 500pounds and therefore fits two adults comfortably. The kayak has an I-beam construction floor for stability, and it is made from extra-thick K-80 polykrylar hull puncture-resistant material. It has detachable and inflatable front and rear seats, inflatable spray skirts, and rear rope handles. Other features include a self-bailing drain valve and two skegs for speed tracking. Sun Dolphin Sit-on top-Bali is a one person sit-on-top budget kayak. It has remarkable features and comes with the benefits of sit-on-top kayaks of being easy to control and easy to get out of during emergencies. It is the best kayak for beginners. It is also strong and great for lakes and rivers. The kayak weighs 40 pounds and is constructed from Fortiflex high-density UV-stabilized polyethylene material, a material that can withstand salty waters. Its length is 10 feet, and its width is 30 inches. In addition, it has a maximum weight capacity of 250 pounds. It has large seating pads. It has enough storage space with a compartment for dry stuff. 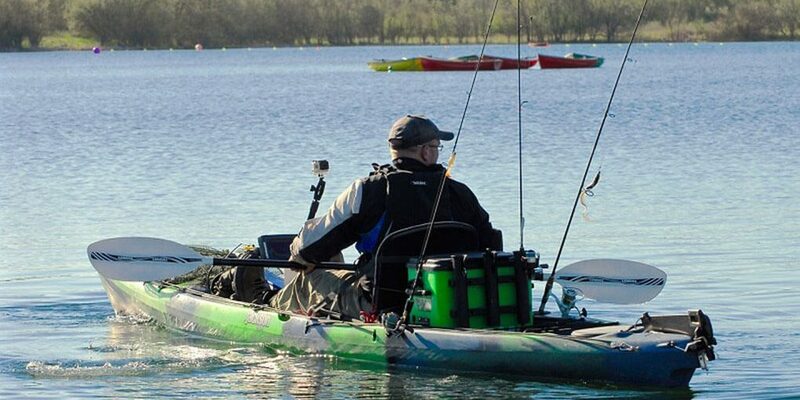 The kayak has a portable accessory carrier that can be used for storage. You have about six colors to suit your personal tastes and preferences. Unfortunately choosing a different color will cost you more in terms of dollars. The most affordable is the blue kayak. SUNDOLPHIN Sit-in 10-Foot kayak is an excellent choice for those starting out in the kayaking sport. It is ideal for kayaking in rivers and lakes. The kayak comes in a lightweight easy to maneuver design. The kayak is made from UV-stabilized rugged high-density Fortiflex polyethylene and is therefore quite stable, and tracks with ease. Unfortunately for reasons unknown, it costs more to buy the other two colors olive and sand. The most affordable is the Gray Swirl. Other features include a large cockpit, two flush mount rod holders, one swivel rod holder, a storage compartment, a water bottle holder and protective thigh pads. Also incorporated are carrying handles, an adjustable padded seat, shock cord deck rigging, and adjustable foot pads. The kayak, therefore, has enough storage space for your rods and fishing gear and personal items. 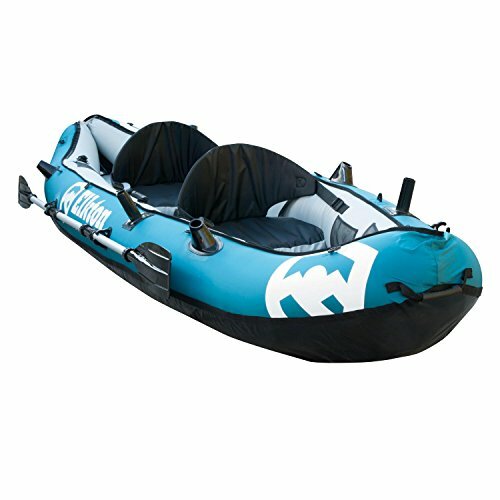 Elkton Outdoors- Inflatable 10' Ft is an inflatable fishing kayak that comes with the benefits of inflatable items of being very light and compact and therefore easy to transport and store. It is an easy to control kayak that tracks well. 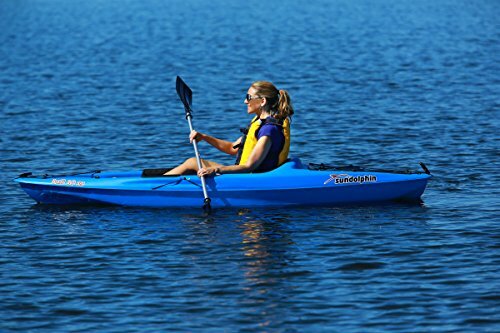 It is a two-person kayak made from 18-Gauge tear resistant 1000D PVC and therefore durable. The fully inflated kayak is 118 by 35 by 16 inches. Designed to fill with air pressure, it inflates quickly. Accessories include a carry bag, a repair kit, a foot pump, six-rod holders (four trolling and two vertical), double-sided oars and two adjustable seats. It comes with six mesh pockets for storing your gear and other items. The good thing with this kayak is that it comes with a repair kit. The kayak is also easy to repair. Danger of over-inflating the kayak, because it fills up too quickly. It can cause it to burst. 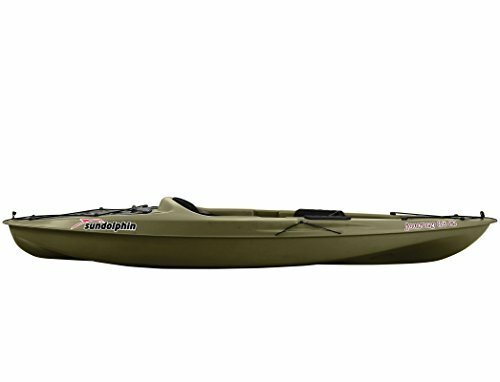 SUNDOLPHIN Journey is a great sit-on-top kayak that comes with everything you need on your fishing journey. The design and construction suit it for kayaking in rivers and lakes. It is made from UV-stabilized rugged high-density Fortiflex Polyethylene. It is lightweight and therefore very portable. It has a maximum weight capacity of 250 pounds. The kayak is stable and therefore tracks and paddles well. The kayak comes with the following features, protective thigh pads, a large and open cockpit, adjustable padded seat and shock cord deck rigging. Its storage features include a storage compartment, a water bottle holder, one swivel rod holder, and two flush mount rod holders. It also comes with carrying handles for your convenience. They have only two colors to choose from, sand and olive. Unfortunately, you will be charged more for buying the sand color. 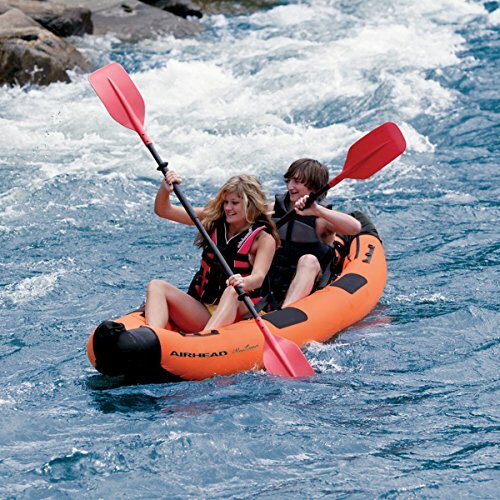 Airhead-MONTANA is a two-person inflatable kayak that is an easy carry along. Simply pack it when you are out camping, vacationing or exploring the countryside. It can be used in moderate white waters and lakes. The kayak has a maximum weight capacity of 500 pounds. It is made from a combination of 840-denier nylon and semi-rigid heavy gauge PVC and supported by its Tubular I-beam floor giving it comfort, buoyancy, and tracking. It has a UV and water-resistant coating. It has good reinforcements, and three air chambers are enclosed. The kayak has two valves for quick inflating and deflating. It also has storage space. A conspicuous color orange, it is 12 feet long and weighs 36.3. In addition, it has adjustable seats, handles, drain plug and neoprene elbow guards. It also has six D-rings that secure the gear and stretched netting in the bow. Intex- K2 Explorer is a kayak that will suit you if you are on a tight budget yet you still want a kayak with a good built. It is one of the most affordable fishing kayaks retailing at below $100. The kayak is designed to be used in small water bodies like mild rivers and lakes. The kayak has a maximum weight capacity of 400 pounds, and its dimensions are 20 x 36 x 123 inches. It is constructed from heavy-duty vinyl and supported by an I-beam floor. For a smooth fishing expedition, it comes with a removable skeg for providing directional stability. The kayak has a comfortable and spacious cockpit. In addition, it has two inflatable and adjustable seats that have back rests. It also has grab lines and handles and comes with a repair kit. It is designed in a bright yellow conspicuous color, which is good in case of an emergency. It has Boston valves for quick inflation and deflation. A package includes a high-output pump and two 86”aluminum oars. 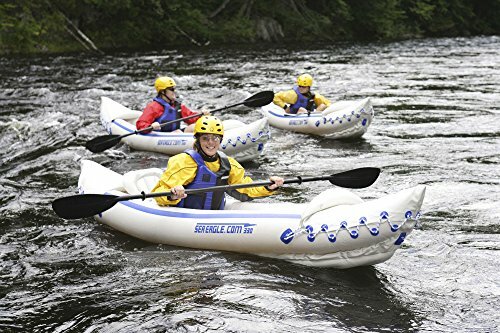 Sevylor Inflatable 3-Person kayak is perfect for white water rafting. It can also be used for fishing and other kayaking sports. It is an inflatable three-person kayak made from a combination of heavy-duty PVC and rugged tarpaulin. The material is tear resistant and durable. Its dimensions are 12 feet 3 inches by 3 feet 1 inch and a maximum weight capacity of 490lbs. 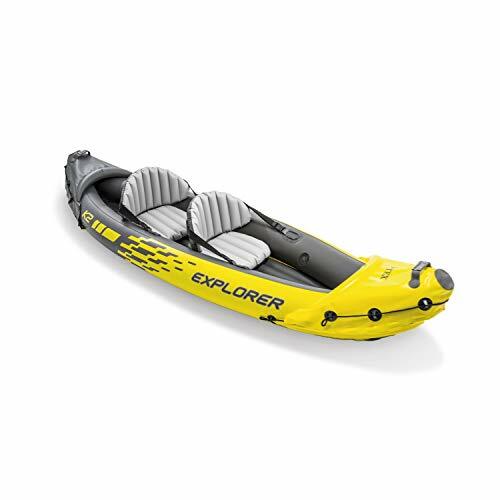 The kayak comes with three air chambers and an airtight system to prevent leaks. It has a threaded Boston valve for easy inflation and deflation. The kayak has adjustable seats, Velcro holders for putting paddles and handles for easy transportation. In addition, it has spray covers to keep you dry during kayaking. 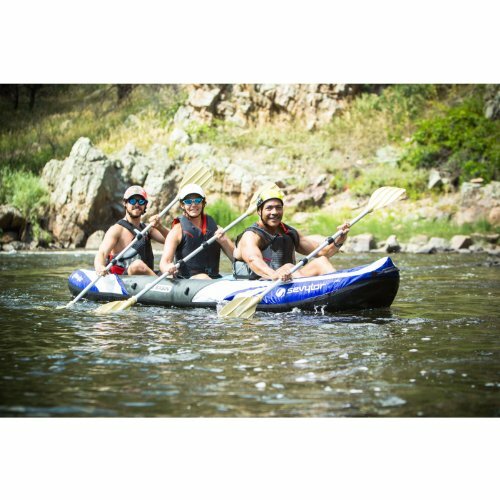 Sevylor Coleman kayak is an inflatable two-person kayak with great features to give you an awesome all day kayaking experience. It is constructed from 18-gauge PVC, and therefore the kayak can be used for kayaking in rivers and lakes because it is stable, strong and resistant to damage. The Sevylor Comenan has an 840D nylon cover and a 1000D tarpaulin bottom to protect it from punctures. In addition, the kayak has multiple air chambers in addition to an airtight system for preventing leaks. Further, this 2-person yak comes at an affordable price. You can also enhance your fishing experience with Sevylor’s trolling motor fittings. It has a large cockpit, for convenience boarding or getting out. The adjustable seat has a backrest. This will come in handy if you are kayaking for long hours. The kayak also has ample storage space. In addition, it has a water bottle holder and a shock-cord deck rigging, which can also be used for storage. It also has mesh storage pockets for keeping snacks and other things nearby. It has paddle holders and D-rings. It also has a double threaded boston valve for easy inflation and deflation. One thing you need to accept is that kayaks that go for low prices may not necessarily be the best on the market. However, that doesn’t mean that you have to settle for less. In fact, as long as you can keep the following pointers in mind, there’s no reason why you shouldn’t get a pretty good deal. Try to find a yak that can be used both in the river as well as the lake. This way, you can enjoy greater fishing freedom. As you know, angling tends to get better when there are no restriction placed on your creativity. Go for a kayak that has adjustable seat backs and foot braces. In particular, you need something that comes with molded foot rests. These come in handy in providing you with the comfort you need for all-day fishing. Of course, you’ll need to have a yak that can accommodate all of your stuff. We’re talking about your fishing gear, cameras, fishing sunglasses, boots and an entertainment system. So, if you could get a kayak with a generous rear and cockpit, you’d enjoy your trip even more. As a kayaker, you’re bound to run into some muddy terrains. And for that reason, you need to make sure that you go for a yak made from a material that’s easy to maintain. Also, you want to make sure that the material is capable of withstanding the impact of a scorching sun. There are two common types of kayaks namely – sit-in and sit-on-top. Sit-on-top yaks are generally recommended for beginners and that’s because they’re highly user-friendly and stable. On the flipside, though, they can easily make your feet wet. Sit-in kayaks on the other hand are comfortable and generally keep you warm. On the flip-side, though, they limit your freedom of movement especially in the water. We’d go with the Sun Dolphin Sit-on top-Bali SS 10-Foot Kayak. Not only is it affordable but also quite reliable. We’d also recommend it because we find that it provides you with good value for money. 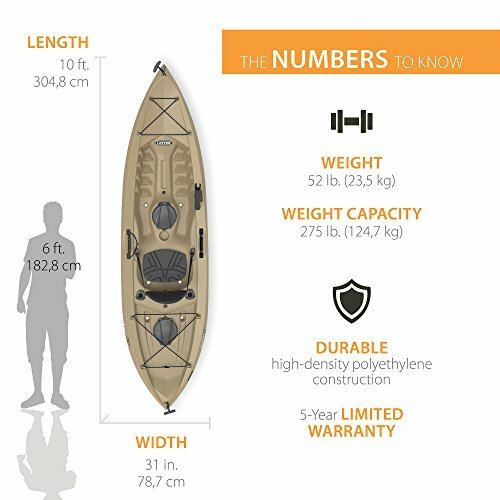 With all these facts stated, it’s always important to buy a kayak that meets your exact expectations. Fortunately, with the buying guide above, finding one such watercraft doesn’t have to be an insurmountable task.